Wondering what is the ideal job for you? Have you started hating your job? Well, you can blame your birth date for this. Star signs have a significant role to play in your life, and they influence essential aspects like career, health, marriage, etc. 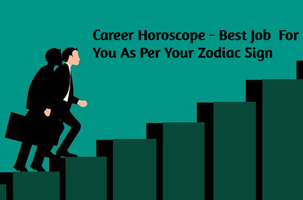 As per daily career horoscope, zodiac signs have a direct impact on your behaviour and personality traits, which in turn influence your career path. But saying that does not mean that you blindly leave your professional decisions on your stars. Your birth time along with various other factors define a fruitful employment path, and there is no harm taking help of career horoscope to know the ideal job for you. Become rich and enjoy job satisfaction by knowing which job is perfect for your zodiac sign. Find out which job is suitable for you, based on your zodiac sign. The youngest of all zodiac signs, Aries have a high possibility of becoming successful police officers, athletes, or firefighters. Symbolized by the Ram sign, you may also pursue boxing. Aries are strong-willed, enthusiastic, vibrant, and notoriously competitive. They are physically strong creatures and do not fit in desk jobs. You are a born leader and enjoy incredible perseverance that helps you perform well at work. Your managerial skills help you take up different tasks and initiative, but avoid praising your accomplishments. Let your work speak for itself. Suitable jobs for Aries: sportsperson, government official, manager. Something a Taurus appreciates most is stability. They will buckle down and work hard to guarantee results including job security, remuneration, vacation time, and higher benefits. Taureans carry deep affection for beautiful things and love working with nature, food, flowers, gems, and other extravagant things. As per free career horoscope, you are likewise known for your solid voice and unmistakable attitude, and you do well as a commentator, public speaker, or secretary. Suitable jobs for Taurus: designer, accountant, lawyer, engineer. With unmatched communication skills, you make expert poets, songwriters, and novelists. Loaded with an exceptional amount of imaginative energy you, are highly social, curious, and witty. You have an inquisitive nature, and you do well in jobs related to media and journalism. You avoid routine work and prefer flexibility at your workplace. Your flexible nature helps you adapt effortlessly from one job to another. Situations involving networking and traveling are perfect for you. Best career options for Gemini: teacher, architect, stockbroker, machine operator, technical support. The "mother" of all star signs is good at doing delicate tasks that require taking care of things and nurturing; however, this is not only confined to pets and kids. Multitasking Cancer also makes a good executive. You are highly protective and are always looking forward to giving valuable advice. People born under this zodiac sign are highly responsible and are expert problem-solvers. Suitable jobs for Cancers: social worker, gardener, childcare, teacher, human resources. Symbolized by the Lion sign, you are a born leader and bring success and profit to your company. You deliver your best when you are being noticed. You are independent, fearless, have an inspiring nature, and love doing jobs which bring power and status. Your massive ego may result in disruption against you, so try to maintain a balance with your charm. Your team skill makes you an excellent coworker, but you perform even better as a leader. Suitable jobs for Leo: salesperson, CEO, tour guide, performer, government employee. Known for their sense of perfectionism, Virgos perform well in detail-oriented jobs. You excel in the field of abstract thinking and remember essential things effortlessly. Service- type jobs are also suitable for you. Your meticulous brain helps you perform well in statistics, research, and writing jobs. Your cheerful nature helps you gel up with people quickly. Suitable Jobs for Virgo: statistician, teacher, writer, critic. Gracious, charming, entertaining, and good-looking, Librans are highly cooperative and make efficient team leaders. Customer services jobs are more suitable for you. You are often referred to as "people's people" and work well in a buzzing and social environment. You enjoy a particular inclination towards art and music. Suitable jobs for Libra: navigator, host, dancer, supervisor, diplomat. You are best suited for complicated jobs like heart surgery. Your ability to focus on things helps you concentrate well by blocking all distractions around you. Scorpions are very intuitive and do not enjoy being cross-verified. Suitable career options for Scorpio: lawyer, detective, surgeon, scientist. Your ethics and decision-making power make you an easygoing and fair boss. Your spiritual nature may also force you to take up jobs in similar fields including religion, animals, and environmental conservation. You are not fit for routine jobs, and your outgoing nature helps you gel up with your co-workers easily. Suitable jobs for Sagittarius: coach, public relations, minister. Highly ambitious Capricorn is always up for new challenges. You are persistent and determined and do not leave any stone unturned to taste success. You are highly responsible, a workaholic, and prefer following a proper schedule. Preferable career options for Capricorn: banker, administrator, manager, editor. Your humanitarian nature sets you apart from the crowd. Aquarians are highly curious and adventurous in life and prefer taking up unconventional jobs. You hate repetitive work and are always looking for new options and a fresh approach. Best jobs for Aquarius: inventor, scientist, designer, organic farmer. The oldest of the 12 zodiac signs, Pisces are highly creative and passionate. You excel in jobs related to styling and traditional art. Many Pisces are seen practicing astrology and tarot reading. Suitable career option: hair stylist, artist, nurse, psychologist. This article copyright © 2019 Manisha Kothari. All rights reserved. Reproduction without permission prohibited. Manisha Kothari is a content writer who offers copy-writing, ghost-writing and blogging services. She works closely with Horoscopelogy providing unique and eye-catching content that enhances their search engine visibility and gains social media attention. Check out: Career Horoscope.